The holiday season in the 21st century. Your boarding pass has been booked, the casserole is wrapped, and that amazon prime shipping saved you last minute. We can work on procrastination after the new year. For now it’s time for festivities, eating hearty, sharing hearth, and most importantly, the inevitable escape to the silver screen. A holiday trip to the movies after the presents have been unwrapped, and the eggnog has been sapped. Or maybe you prefer sitting on the couch, wrapped in blankets for a more intimate viewing experience. Either way, movies inevitably play a role in nearly everyone’s holiday tradition. But when did this begin? Interestingly Christmas movies are almost as old as movies themselves. For your viewing pleasure, we present the first Christmas movie ever made: Santa Claus, directed by George Albert Smith in 1898. To put it in perspective, this movie was made only 10 years after the first ever moving picture was filmed and interestingly this film is not only the first Christmas movie, but a landmark in film history. George Albert Smith, short film director, and film pioneer. George Albert Smith in his study. Source: Wikimedia Commons. We live in the era of character-driven drama. Hyper-produced stories stuffed to the brim with rich characters, intersecting plots, and ultimately cut obsessively on the editing room floor. Most of these techniques are to be expected in modern productions, but it’s been a longer journey than you may think. 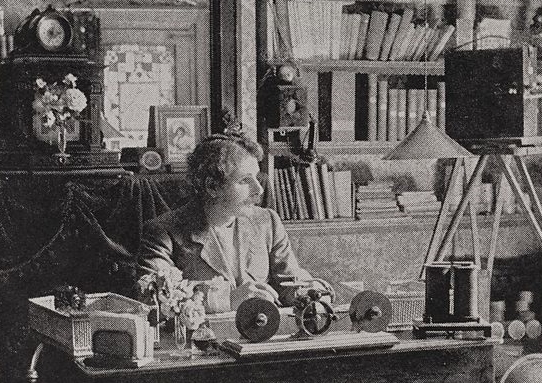 A hundred and twenty years ago a director named George Albert Smith was quietly working away on his catalog of short films. One film in particular left a pretty major impact. Smith’s Santa Claus(1898) begins as an unassuming looking short film, but then something quite remarkable happens 30 seconds in. The light switches off, and immediately we’re met with a spotlight. In that spotlight another actor appears and with that edit, this film becomes one of the very first to utilize parallel action. Often referred to as cross-cutting, parallel action is a technique used to depict two distinct actions cut simultaneously. While this film may seem aesthetically uninteresting, or simple given the production of contemporary films, it shines in ingenuity. Smith transports his audience to an entirely new setting and introduces a new character all without leaving the room. This is accomplished using a film technique called double exposure. Double-exposure is the process of super-imposing two or more exposures(or frames) to create one unified image. This is used in both film, and photography but simply put acts as an overlay to join two frames together. He uses this technique in Santa Claus, as well as another movie Photographing a Ghost. In addition to double exposure, Smith also developed other editing tricks such as close ups and point of view shots to enrich the audience’s experience of his movies and allow more complex plots. Smith was the first to use these techniques and today he is considered the father of film editing. Below is a short film made by Smith in 1899 titled A kiss in the tunnel. In the film a train passes through a tunnel and a couple inside one of its cars takes advantage of the darkness and exchanges a few covert kisses, something totally scandalous in the late Victorian era. This is an example of editing for continuity between two sequences. In the earliest days of film, movies were just recorded live performances. The idea of seeing a moving picture was a novelty in itself, so there was no need for storytelling. The first films were either street scenes, or maybe scenes of performers standing in front of a camera doing tricks. In the late 1890’s that changed. The first ever instance of editing for continuity in film was in Robert W. Paul’s Come Along, Do! (1898) in which a couple eats lunch outside and then walks into a museum to view artifacts. Not the best story ever, but nonetheless it does have a plot with one scene leading to another. George Albert Smith took the concept to the next level in films like the one above, focusing on more interesting and sometimes even salacious topics. Gradually the stories got more complex. Imagine going to the movies today to watch three people standing around in a room juggling for two hours. Thanks to George Albert Smith we don’t have to do that. Instead, multiple characters and locations and stories can be intertwined. You could say editing was Smith’s Christmas gift to future generations. In addition to basically inventing film editing, Smith also invented the first practical color movie film. His process was was called Kinemacolor. The first film in Kinemacolor, A Visit to the Seaside, premiered in 1908. Smith was also part of a paranormal investigation organization called the Society for Psychical Research. Before he became interested in film, Smith was a stage performer who claimed to be Psychic. The Society studied him and proclaimed him to be a genuine psychic and afterward he joined the organization. 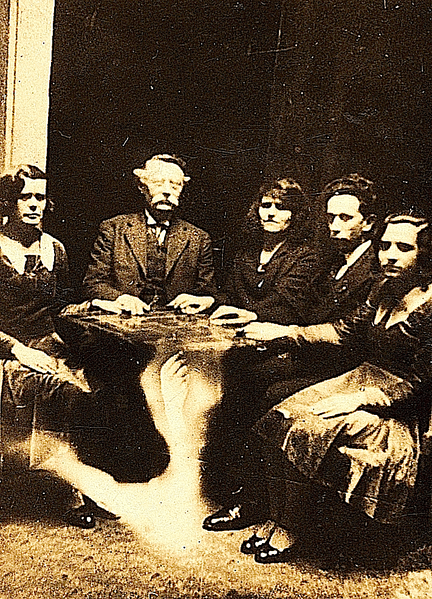 Seance attended by members of the Society for Psychical Research. So when you’re hanging out with family watching your favorite holiday flick (in my case Die Hard) remember that it’s all thanks to a 19th century psychic who was tired of watching jugglers. And after the movie make sure to visit the Houston Museum of Natural Science, where you can bask in the joy of the Holiday season at our White Christmas event in the Cockrell Butterfly Center or relive your childhood in our Trains over Texas exhibit, an expansive model train set (the size of a tennis court) traversing a scale model of Texas’ most famous landmarks including a miniature Houston and a baby Big Bend National Park.